Fonts provide a character map that details the set of characters for they have glyphs. If a document contains characters not supported by a specified font, a user agent may revert to a system font fallback procedure to find glyphs to render these characters correctly. If no font can be found, some form of "missing glyph" character is rendered by the user agent. Often these are the result of authors failing to explicitly indicate the encoding used by a document. This property specifies a prioritized list of font family names or generic family names. A user agent iterates through the list of family names until it matches an available font that contains a glyph for the character to be rendered. This allows for differences in available fonts across across platforms and for differences in the range of characters supported by individual fonts. If Helvetica is available it will be used when rendering. If neither Helvetica or Verdana is present, then the user agent defined sans serif font will be used. The name of a font family of choice such as Helvetica or Verdana in the previous example. Font family names containing more than one word should be quoted. If quoting is omitted, whitespace characters before and after the font family name are ignored and any sequence of whitespace characters inside the font name is converted to a single space. Depending upon the font format used, font family names may be case-sensitive. The following generic family keywords are defined: ‘serif’, ‘sans-serif’, ‘cursive’, ‘fantasy’, and ‘monospace’. These keywords can be used as a general fallback mechanism when an author's desired font choices are not available. As keywords, they should not be quoted. Authors are encouraged to append a generic font family as a last alternative for improved robustness. Glyphs of serif fonts, as the term is used in CSS, have finishing strokes, flared or tapering ends, or have actual serifed endings (including slab serifs). Serif fonts are typically proportionately-spaced. They often display a greater variation between thick and thin strokes than fonts from the ‘sans-serif’ generic font family. CSS uses the term ‘serif’ to apply to a font for any script, although other names may be more familiar for particular scripts, such as Mincho (Japanese), Sung or Song (Chinese), Batang (Korean). Any font that is so described may be used to represent the generic ‘serif’ family. Glyphs in sans-serif fonts, as the term is used in CSS, have stroke endings that are plain -- without any flaring, cross stroke, or other ornamentation. Sans-serif fonts are typically proportionately-spaced. They often have little variation between thick and thin strokes, compared to fonts from the ‘serif’ family. CSS uses the term ‘sans-serif’ to apply to a font for any script, although other names may be more familiar for particular scripts, such as Gothic (Japanese), Kai (Chinese), or Gulim (Korean). Any font that is so described may be used to represent the generic ‘sans-serif’ family. Font formats that use a scale other than a nine step scale should map their scale onto the CSS scale so that 400 roughly corresponds with a face that would be labeled as Regular, Book, Roman and 700 roughly matches a face that would be labeled as Bold. Or weights may be inferred from the style names, ones that correspond roughly with the scale above. The scale is relative, so a face with a larger weight value should never appear lighter. If style names are used to infer weights, care should be taken to handle variations in style names across locales. Although not well-loved by typographers, bold faces are often synthesized by user agents for faces that lack actual bold faces. For the purposes of style matching, these faces should be treated as if they exist within the family. 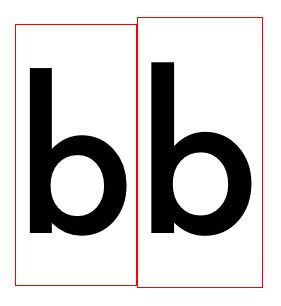 Values of ‘wider’ and ‘narrower’ indicate values relative to the width of the parent element. Based on the inherited font-stretch value, the width used is calculated using the chart below. Child elements inherit the calculated width value, not a value of ‘wider’ or ‘narrower’. Issue: relative width values wider, narrower are being considered for removal. Specifies a face that is not labeled as a small-caps font. The following table provides user agent's guideline for the absolute-size scaling factor and their mapping to XHTML heading and absolute font-sizes. The ‘medium’ value is used as the reference middle value. The user agent may fine tune these values for different fonts or different types of display devices. In situations where font fallback occurs, fallback fonts may not share the same aspect ratio as the desired font family and will thus appear less readable. The font-size-adjust property is a way to preserve the readability of text when font fallback occurs. It does this by adjusting the font-size so that the x-height is the same irregardless of the font used. How text rendered in each of these fonts compares is shown below, the columns show text rendered in Verdana, Futura and Times. The same font-size value is used across cells within each row and red lines are included to show the differences in x-height. In the upper half each row is rendered in the same font-size value. The same is true for the lower half but in this half the font-size-adjust property is also set so that the actual font size is adjusted to perserve the x-height across each row. Note how small text remains relatively legible across each row in the lower half. The ‘font’ property is, except as described below, a shorthand property for setting ‘font-style’, ‘font-variant’, ‘font-weight’, ‘font-size’, ‘line-height’, and ‘font-family’, at the same place in the style sheet. The syntax of this property is based on a traditional typographical shorthand notation to set multiple properties related to fonts. 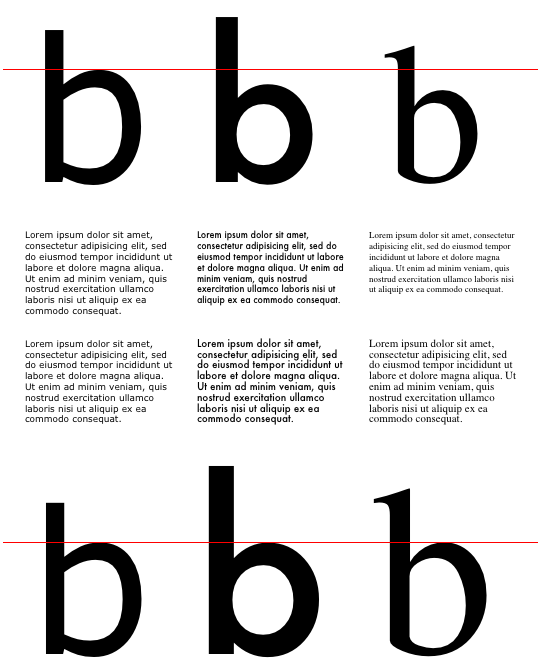 All font-related properties are first reset to their initial values, including those listed in the preceding paragraph plus ‘font-stretch’ and ‘font-size-adjust’. Then, those properties that are given explicit values in the ‘font’ shorthand are set to those values. For a definition of allowed and initial values, see the previously defined properties. For reasons of backwards compatibility, it is not possible to set ‘font-stretch’ and ‘font-size-adjust’ to other than their initial values using the ‘font’ shorthand property; instead, set the individual properties. The first three rules do not specify the ‘font-variant’ and ‘font-weight’ explicitly, so these properties receive their initial values so this property receives its initial value (‘normal’). Notice that the font family name "new century schoolbook", which contains spaces, is enclosed in quotes. The fourth rule sets the ‘font-weight’ to ‘bold’, the ‘font-style’ to ‘italic’, and implicitly sets ‘font-variant’ to ‘normal’. System fonts may only be set as a whole; that is, the font family, size, weight, style, etc. are all set at the same time.These values may then be altered individually if desired. If no font with the indicated characteristics exists on a given platform, the user agent should either intelligently substitute (e.g., a smaller version of the ‘caption’ font might be used for the ‘smallcaption’ font), or substitute a user agent default font. As for regular fonts, if, for a system font, any of the individual properties are not part of the operating system's available user preferences, those properties should be set to their initial values. The @font-face rule allows for linking to fonts that are automatically activated when needed. This permits authors to work around the limitation of "web-safe" fonts, allowing for consistent rendering independent of the fonts available in a given user's environment. A set of font descriptors define the location of a font resource, either locally or externally, and the style characteristics of an individual face. Multiple @font-face rules can be used to construct font families with a variety of faces. Using CSS font matching rules, a user agent can selectively download only those faces that are needed for a given piece of text. Downloaded fonts are only available to documents that reference them, they should not be made available to other applications or other documents. User agent implementors might consider it convenient to use downloaded fonts when rendering characters in other documents for which no other available font exists as part of the system font fallback procedure. This however leads to non-deterministic rendering patterns where the appearance of a page effectively becomes a function of browsing history. User agents which do not understand the @font-face rule encounter the opening curly bracket and ignore forward until the closing curly bracket. This at-rule conforms with the forward-compatible parsing requirement of CSS, parsers may ignore these rules without error. Any descriptors that are not recognized or implemented by a given user agent must be ignored. @font-face rules require a font-family and src descriptor, if either of these are missing the @font-face should be ignored. In cases where user agents have limited platform resources or implement the ability to disable downloadable font resources, @font-face rules should simply be ignored; the behavior of individual descriptors as defined in this specification should not be altered. This descriptor specifies the resource containing font data. It is required, whether the font is downloadable or locally installed. It's value is a prioritized, comma-separated list of external references or locally installed font face names. When a font is needed the user agent iterates over the set of references listed, using the first one it can successfully activate. Fonts containing invalid data are treated as if they were not found, the user agent loads the next font in the list. External references consist of a URI, followed by an optional hint regarding the format of the font resource referenced by that URI. The format hint contains a comma-separated list of format strings that denote well-known font formats. Conformant user agents should skip downloading a font resource if the format hints indicate only unsupported or unknown font formats. If no format hints are supplied, the user agent should download the font resource. Given the overlap in common usage between TrueType and OpenType, for the purpose of a format hint "truetype" and "opentype" should be considered as synonymous; a format hint of "opentype" does not imply that the font contains Postscript CFF style glyph data or that it contains OpenType layout information (see Appendix A for more background on this). The "truetype-aat" string indicates that a font contains Apple Advanced Typography tables so user agents on platforms that do not support these tables should treat this format as unsupported. This allows authors to provide multiple fonts for rendering complex scripts such as Arabic or Devanagari that require platform-specific font data. Issue: does a public registry need to be established for these hints? As with other URIs in CSS, the URI may be partial, in which case it is resolved relative to the location of the style sheet containing the @font-face rule. In the case of SVG fonts, the URL points to an element within a document containing SVG font definitions. If the element reference is omitted, a reference to the first defined font is implied. The locally installed <font-face-name> is a format-specific string that uniquely identifies a single font face within a larger family. For TrueType and OpenType fonts, the full font name as defined in the font name table is used to reference a given face. Additionally, for TrueType and OpenType fonts user agents may optionally support Postscript name lookup on platforms where that is appropriate. The notation for a <font-face-name> is the unique font face name enclosed by "local(" and ")". The name can optionally be enclosed in quotes. This also allows for referencing faces that belong to larger families that cannot otherwise be referenced. If a font face with a given full font name or Postscript name is not found, the user agent loads the next font in the list, platform substitutions for the font should not be used. These descriptors define the characteristics of a font face and are used in the process of matching styles to specific faces. For a font family defined with several @font-face rules, user agents can either download all faces in the family or use these descriptors to selectively download font faces that match actual styles used in document. The values for these descriptors are the same as those for the corresponding font properties except that relative keywords are not allowed: bolder, lighter, wider, narrower. If these descriptors are omitted, default values are assumed. The value for these font face style attributes is used in place of the style implied by the underlying font data. This allows authors to combine faces in flexible combinations, even in situations where the original font data was arranged differently. User agents that implement synthetic bolding and obliqueing should only apply synthetic styling in cases where the font descriptors imply this is needed, rather than based on the style attributes implied by the font data. Ranges that do not fit any of the above three forms are considered to be parse errors and the descriptor is omitted. Interval ranges consisting of a single code point are valid. Ranges specified with ‘?’ that lack an initial digit (e.g. "U+???") are also valid, and are treated as if there was a single 0 before the question marks (thus, "U+???" = "U+0???" = "U+0000-0FFF"). "U+??????" is not a syntax error, even though "U+0??????" would be. Ranges can overlap but interval ranges that descend (e.g. U+400-32f) are invalid and omitted rather than treated as parse errors; they have no effect on other ranges in a list of ranges. Ranges are clipped to the domain of Unicode code points (currently 0 - 10FFFF inclusive); a range entirely outside the domain is omitted. Without any valid ranges, the descriptor is omitted. User agents may normalize the list of ranges into a list that is different but represents the equivalent set of character code points. The character range can be a subset of the full character map of the underlying font. The effective unicode-range used when mapping characters to fonts is the intersection of the unicode range specified and the underlying character map of the font. This means that authors do not need to define the unicode-range of a font precisely, broad ranges for which a sparse set of code points are defined in the font can be used. Code points outside of the defined unicode-range are ignored, irregardless of whether the font contains a glyph for that code point or not. User agents that download fonts for characters outside the defined unicode-range are considered non-conformant. Likewise, user agents that render a character using a font resource for which the defined unicode-range does not include that character are also considered non-conformant. The user agent again first checks the unicode-range of the font containing Latin characters. Since U+2000-2300 includes the arrow code point (U+21E8), the user agent downloads the font. For this character however the Latin font does not have a matching glyph, so the effective unicode-range used for font matching excludes this code point. Next, the user agent evaluates the Japanese font. 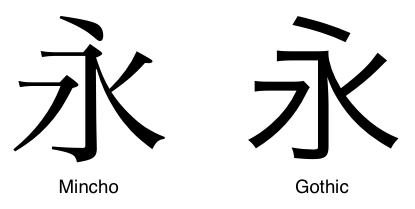 The unicode-range for the Japanese font, U+3000-9FFF and U+ff? ?, does not include U+21E8, so the user agent does not download the Japanese font. Next the fallback font is considered. The @font-face rule for the fallback font does not define unicode-range so it's value defaults to the range of all Unicode code points. The fallback font is downloaded and used to render the arrow character. The procedure for choosing fonts consists of iterating over the font families determined by the font-family property, selecting a font face with the appropriate style based on other font properties and then determining whether a glyph exists for a given character. This procedure is performed on each character to be rendered. Optimizations are allowed provided that an implementation behaves as if the algorithm had been followed exactly. Matching occurs in a well-defined order to insure that the results are as consistent as possible across user agents, given an identical set of available fonts and rendering technology. To begin with, a user agent must determine the set of font families available on a given platform and determine the style characteristics of all faces for each family. If two faces have the exact same style characteristics, one of them is ignored. Fonts available via @font-face rules are referenced per document and are not treated as generally available fonts. For each character within a given element, the user agent evaluates the font properties applicable. The user agent starts with the first family name in the ‘font-family’ prioritized list. If the family name is a generic family name, the user agent looks up the appropriate font family name to be used. User agents may choose the generic font family to use based on the language of the containing element or the Unicode range of the character. The user agent attempts to find the family name among fonts defined via @font-face rules and then among available system fonts. ‘font-stretch’ is tried first. ‘normal’ matches a font not labeled as ‘condensed’ or ‘expanded’. ‘font-style’ is tried next. ‘italic’ will be satisfied if there is either a face in the UA's font database labeled with the CSS keyword ‘italic’ (preferred) or ‘oblique’. Otherwise the values must be matched exactly or font-style will fail. ‘font-variant’ is tried next. ‘normal’ matches a font not labeled as ‘small-caps’; ‘small-caps’ matches (1) a font labeled as ‘small-caps’, (2) a font in which the small caps are synthesized, or (3) a font where all lowercase letters are replaced by uppercase letters. 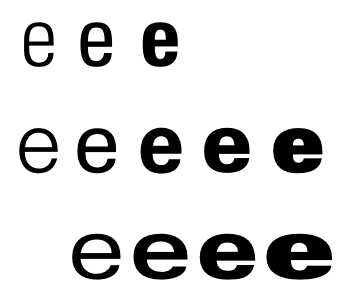 A small-caps font may be synthesized by electronically scaling uppercase letters from a normal font. If no matching face exists or the matched face does not contain a glyph for the character to be rendered, the next family name is selected and the previous two steps repeated. If the matched font is defined via an @font-face rule, the font resource is downloaded. Otherwise if the matched font is defined via @font-face and needs to be downloaded, the user agent can either wait until the font is downloaded or render once with substituted font metrics and render again once the font is downloaded. If a particular character cannot be displayed using any font, the user agent should indicate by some means that a character is not being displayed, either by displaying a symbolic representation of the missing glyph or using the ‘missing character’ glyph from another font. Font properties in CSS are designed to be independent of the underlying font formats used; they can be used to specify bitmap fonts, Type1 fonts, SVG fonts in addition to the common TrueType and OpenType fonts. But there are facets of the TrueType and OpenType formats that often cause confusion for authors and present challenges to implementors on different platforms. Originally developed at Apple, TrueType was designed as an outline font format for both screen and print. Microsoft joined Apple in developing the TrueType format and both platforms have supported TrueType fonts since then. Font data in the TrueType format consists of a set of tables distinguished with common four-letter tag names, each containing a specific type of data. For example, naming information, including copyright and license information, is stored in the ‘name’ table. The character map (‘cmap’) table contains a mapping of character encodings to glyphs. Apple later added additional tables for supporting enhanced typographic functionality; these are now called Apple Advanced Typography, or AAT, fonts. Microsoft and Adobe developed a separate set of tables for advanced typography and called their format OpenType. Rendering complex scripts that use contextual shaping such as Thai, Arabic and Devanagari requires features present only in OpenType or AAT fonts. Currently, complex script rendering is supported on Windows and Linux using OpenType font features while AAT font features are used under Mac OS X. Apple has indicated it intends support complex script rendering using OpenType font features in the future. The use of fonts on the web is often surrounded in controversy. Font designers expend huge amounts of effort to create their designs, painstakingly refining letterforms and tuning font data to assure that the letterforms appear as desired both in print and on the screen. As a result they often license their fonts very carefully, often with somewhat complex terms. Authors who want to use specific fonts via a downloadable font mechanism must always carefully verify that their intended use is within the scope of the font license. Many commercial fonts presently do not allow web downloading of their fonts in any form. Font formats often store references to the font license within the font data itself. When in doubt, it's best to verify with the font designer directly. Vendors that bundle fonts with their products are also strongly encouraged to carefully explain the license details that covers the fonts they bundle. An author would like to use Gotham, a font designed by Hoefler & Frere-Jones, as a downloadable font for their webpages. But the end-user license agreement that covers Gotham specifically notes that usage via @font-face rules in CSS style sheets is not allowed. The author cannot link to this font in their web pages. An author wants to use Gentium, a font developed by SIL International. This font is licensed under the terms of the Open Font License, so as long as the author follows the relatively liberal terms of this license, they can use Gentium as a downloadable font for their web pages.